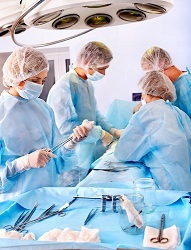 No More Morcellators in Laparoscopic Procedures? Last week, we told you that the FDA has warned against the use of morcellators in laproscopic procedures. The results? More and more hospitals and medical facilities are backing off its use. Used in tens of thousands of procedures each year since the 1990s, the FDA estimates that this cancer, uterine sarcoma, affects one in 350 women undergoing these procedures, and that power morcellation can significantly worsen the odds of long-term survival. A morcellator is used to divide and remove tissue masses during surgery. In a hysterectomy, the device divides the uterus. In myomectomies/fibroidectomies, it is used to dissect the uterine fibroids. The device cuts the tissue mass into pieces, which the surgeon then pulls out through extremely small incisions, allowing for a minimally invasive surgery with no big scars and a shorter recovery time. The concern is that using a powered device to slice undetected, cancerous tissue within the abdomen, without any protective measures, raises the risk of malignant cancer cells embedding in other tissue and elevating the cancer to a more dangerous stage. Because uterine sarcomas can’t be reliably detected before they are removed, they can be mistaken for fibroids. The cancer is typically discovered only after the mass has been removed and tissue sent to a pathologist. Although hospitals are just now learning of this concern, clues of the tool’s potentially fatal flaw goes back to its early use. In the late 1990s, Doctors noticed that they sometimes left behind tissue fragments. Data as early as 2003 suggested that if those fragments were malignant, they could seed rapid cancer growth. Although some morcellator makers have recommended containing the risky tissue in a surgical bag, standard practice for many specialties, gynecologists rarely used bags, considering the risk too low and their use too cumbersome. The FDA’s Obstetrics and Gynecology Devices Panel will hold a hearing July 10-11, 2014 to determine whether to enhance warning labels on morcellators. Questions are now being raised by those diagnosed with cancer following a procedure in which a morcellator was used. Those individuals and their loved ones want to know why warnings were not provided and whether the manufacturers may have failed to make the devices as safe as they could have been. If there were concerns of a “fatal flaw” as early as the ’90s, why are patients just learning about it now, and what else could have been done? Some critics have suggested that morcellators could have been sold together with surgical bags. No doubt these questions and concerns will result in the filing of lawsuits, and based on the sheer volume of procedures done each year, I anticipate the number to be voluminous. If you or a loved one has been diagnosed with cancer, and you feel that the use of a morcellator in a hysterectomy or other procedure may have been the cause, we are here to help you. If you think you might have a potential injury or wrongful death, call us at 800-553-8082 or get a free online consultation here.